You'll find some of the hottest new homes for sale in the South Loop real estate listings below. This downtown community is one of the fastest-growing parts of Chicago for new houses, condos, and townhomes. What used to be an area filled with warehouses and empty parking lots has been transformed throughout recent years to become one of the city's most prominent communities for trendy lofts and glistening condos. Whether you're in the market for your very first home, are thinking about buying another investment property, or are looking for a lavish luxury condo, the market here is so terrifically diverse that there's really something for everyone. If you're looking for a beautiful high-rise overlooking the city, lake, and nearby parks, then you won't want to miss these stunning luxury South Loop condos for sale. Each residence includes what you'd expect in a well-appointed home, from custom stone countertops and solid hardwood flooring to upgraded appliances and everything in between. Enjoy impeccable panoramic views from nearly every room in these spacious contemporary suites, and if you're in the mood for a barbecue with friends or a little post-work run to unwind from the day, you can find these resources and more in your resort-style, amenity-packed building. If you prefer something a little closer to the ground, then you'll adore the selection of townhomes for sale in South Loop. Each space has been carefully considered to offer a considerable amount of space through generous floorplans that are spread out over three or four storeys. These homes include all of the best parts of being in a detached house but with all of the conveniences of downtown living without the added concern for maintenance and exterior upkeep. Just some of the amenities in these homes can include two-car garages, private decks, and outdoor space for gardening. Chicago is a city that's well-known for its abundance of stunning converted lofts. As the city's once-thriving industrial headquarters, the area is home to a number of historic commercial and manufacturing buildings that have been magically transformed into contemporary spaces with rugged exposed brick and craftsman elements. Because they're so wildly in demand, the availability of these spaces are often limited and thus very hard to come by. Between the towering high-rise buildings and new construction zones you'll find a tremendous amount of things to do and places to eat just minutes from the front door of your home or building. Enjoy an impressive selection of diners, cafes, and restaurants that showcase some of the best underground culinary talent in Chicago. Because it's just a little further away from the bustling downtown core, these little-known places to eat are some of the city's best hidden gems. Find exceptional, upscale restaurants with no lines and no reservations needed. 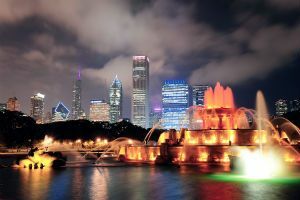 Adjacent to South Loop, between the community and the waterfront, you'll find the enormous and renowned Grant Park, home of the Buckingham Fountain and flower gardens, as well as a number of courts and fields for sports enthusiasts. Catch a game at Soldier Field and go live the action for yourself in one of the nearby baseball diamond. Not really a sports enthusiast? Here are just a few more notable nearby attractions that might appeal to your discerning lifestyle. Want more information about luxury condos for sale in South Loop? Contact Andreas Holder online or by phone at (312) 893 3560 to learn more about the South Loop real estate market and to request a tour of one of the beautiful homes above.